At the Scouting magazine blog, Bryan asked about the uniform policy in troops. You can read the dozens of responses to see the multitude of rules, regulations, guidelines, policies, and requirements folks have made around this one issue. It seems similar to the 'Electronics' policies and 'Active' policies that get created. Somewhere along the line, people get the idea that making a rule and enforcing it is the way to get compliance. That goes against my understanding of the BSA program, which is more along the lines of explaining the expected behavior to the scouts, demonstrating the proper behavior, guiding others towards that behavior, and enabling them to explain, demonstrate, guide, and enable others. As a scoutmaster, I discuss the methods of scouting at each Troop Leader Training session - twice a year. The new troop leaders hear that the uniform is part of scouting and everyone is expected to wear it. They see me in uniform all the time. They get encouragement to wear their uniform. 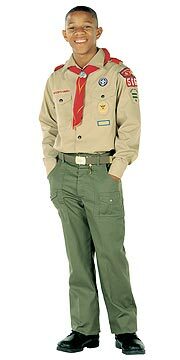 The only policy is that there is a BSA uniform which BSA members should wear. At PLC meetings, troop meetings, and scoutmaster conferences, I recognize scouts for wearing their uniform. Individually at scoutmaster conferences, if he is wearing his uniform completely, I let him know that he really looks like a scout and I'm impressed that he is taking it to heart. If he is just in his shirt, I'll let him know it looks good and find out why he didn't wear the rest. If he doesn't own the pants or socks, or outgrew them, I make sure he and his parent know what they cost and inexpensive options, like eBay. If he has pants and socks and just didn't wear them, then we have more to chat about. At meetings, I have a top secret Little Brown Box with me. The only way to see what's in it is to be wearing the complete uniform. Any scout in his complete uniform can choose an item from the box. I just started this about a month ago to raise interest in wearing the uniform. There is no punishment to a scout for not being in uniform, but there is a reward for doing it completely. Scouts show up at meetings in football pants, baseball pants, shorts, sweats, and t-shirts. When a scout shows up sweaty and dirty, ducks in the bathroom and comes out with his uniform shirt on and half tucked-in, he's participating in the Scouting program and he just demonstrated it's a priority to him to be there. Kind of reminds me of the motley crew in 'Follow Me, Boys' - over the generations, they became more uniformed, but being there was the key thing. The one time I asked a non-uniformed scout to leave was to go outside and remove his football cleats and join the troop barefoot.